It may not look like much to modern eyes - a broken shell fossil found in a cave, but to archaeologists it may well be a work of art from an extinct branch of humanity. 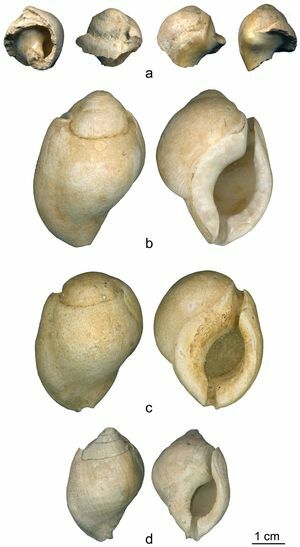 The fossil marine shell, of the species Aspa marginata, was found in a Mousterian layer in the Fumane Cave, northern Italy. It dates from about 47.6 thousand calibrated years before the present, according to the study published in PloS One. This puts the find well before the oldest available dates for modern humans in Europe. The scientists believe the shell to have been decorated for use as a pendant. "The attention put to uniformly cover the outer shell surface with good quality red pigment suggests that this action may have been performed to make the object suitable for visual display. The wear detected on the inner lip, made of overlapping groups of striations oriented perpendicular to the shell main axis, is consistent with a sustained friction produced by a cord rich in abrasive particles, such as sinew," the study's authors write. The scientists also noted that the red ochre was not present in the shell, it was only smeared on the outside. "This discovery adds to the ever-increasing evidence that Neanderthals had symbolic items as part of their culture. Future discoveries will only add to our appreciation of Neanderthals shared capacities with us," the study concluded.